The Danforth Design-Build Team offers a method of project delivery in which we can offer total design-build solutions under one roof. We have integrated a number of services that allow us to do so. Our Team consists of experts who specialize in the various aspects of construction. We seamlessly coordinate amongst design and construction teams, and in many instances we fulfill both of those roles. 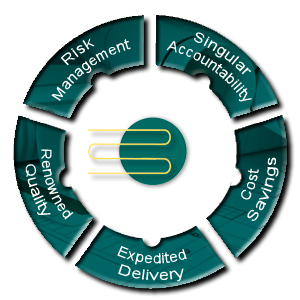 Risk Management – Using our self-performing model, we are able to guarantee cost, schedule, and performance. This allows our clients to focus on their business rather than on the management of the risks associated with large projects. Singular Accountability – Our Team is responsible for the engineering and construction of your project. We take pride in delivering turn-key solutions that meet or exceed our client’s cost, schedule, and performance expectations. Cost Savings – We are able to offer competitive pricing for our projects due to our single layered cost model. Our self-performance saves you money by avoiding additional subcontractor markups and inefficiencies. Our projects also have a proven track-record of providing efficient, sustainable solutions. Expedited Delivery – Our Team is versatile when it comes to meeting the changing demands of today’s Design-Build market. Our in-house capabilities allow us to maximize value-added activities. Also, by taking advantage of state-of-the-art design technologies such as 3D Computer Aided Design (CAD) and Building Information Modeling (BIM), we are able to accelerate design and construction phases to meet the most aggressive project schedules. Renowned Quality – We proudly stand by our project solutions, and we work to ensure that our customer’s expectations are met. We pay attention to detail and combine our knowledge of engineering, construction and comprehensive service to ensure that our customers get the absolute best design-build product on the market today. Start Your Design-Build Project with Danforth. Meet with one of our Design-Build consultants. We’ll outline our process and begin your project estimate. Need More information? Send us a quick message and we’ll reach out to you to help plan your next Design-Build project. Get answers about our Design-Build services and speak with a knowledgeable Design-Build Expert.